Small carriers can go in and out of business, safety ratings can change in a day, and insurance policies can be cancelled at any time. DAT CarrierWatch protects you by continuously monitoring your carriers and alerting you immediately to any change in safety, authority or insurance status. We handle more than 250,000 updates every month so we can keep your business protected. With CarrierWatch you can approve new carriers in seconds. Just enter the carrier’s MC or DOT# and get immediate access to safety, authority, and insurance status. Carrier status is color coded, flagging potential problems. Print the profile and insurance certificate for your records. We have insurance certificates on file for more than 50,000 carriers and you can view and print them. If we don’t have the one you need, we will get it and deliver it quickly. Avoiding bad carriers, unauthorized double-brokering and "chameleon" carriers who disappear overnight are high priorities. Quickly identify carriers with a history of unethical behavior and companies that operate under multiple names or MC numbers to hide their true identity. 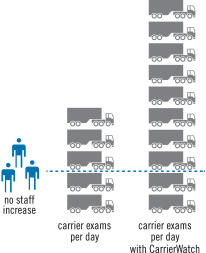 "Up until five years ago we cleared five to ten carriers a day. Now we do 20 to 25, with the same amount of people." Manual carrier validation is subject to human error. Integrating CarrierWatch into your database and transportation management software (TMS) can stop the accidental dispatch of an out-of-service or unsafe carrier. CarrierWatch data comes in multiple formats so you can tighten dispatch control and predetermine which carriers are good to go. Warns you about changes to MC authority, DOT profiles, safety ratings, inspections, crash data, insurance policy changes, renewals and cancellations.